Our dedicated training centre offers the latest technology advancements in products and equipment. Our purpose built training facility with the latest technology spray booth is aimed at offering training to the highest standard from both ourselves and manufacturers. This facility offers our customers an opportunity to try products and equipment with experienced professional training staff, ensuring you achieve efficient application methods and best product practises. This training can be independent with Sayers or combined with the necessary Car, Commercial paint brand manufacturer. We have the ability to bespoke the training to our customer needs and also offer a dedicated training schedule for our specialty products. Verometal, IVE wood coating, Lechler industry coatings and specialised coatings training days are just a few of our coatings where training is available. 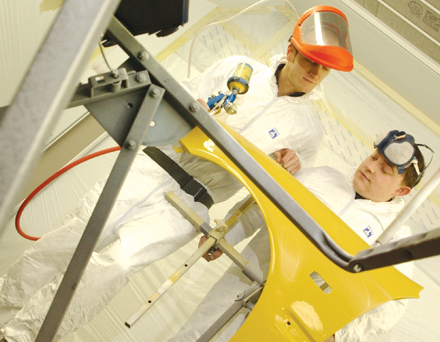 We also have the only dedicated training facility in the UK for Nitrotherm spray. We are also able to offer onsite training for a wide range of our customers. Please contact us to arrange any training requirements.